We have designed this stream to help those just starting out by ensuring they get a comprehensive and graduated program that will lead them, step by step through the necessary skills for safe and enjoyable sea kayaking. We strongly recommend that those starting out use this stream. Paddlers have a choice between certification and none-certification courses. 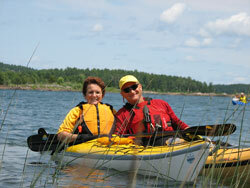 Beginner kayakers are encouraged to complete these designated workshops. To receive the Paddle Canada Flatwater certificate, participants will need to register ahead on the official registration form. Together they introduce the skills and attitudes necessary for safe independent sea kayak travel. You must indicate which stream you want when registering.